As technology improves the market gets flooded with innovative ways of treating unique conditions. Many health conditions benefit from an EMS (Electrical Muscle Stimulator) and so you’ll find quite a few devices that provide this. 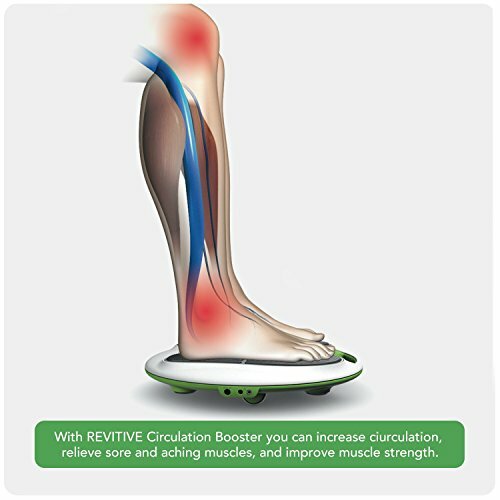 We reviewed the Revitive Circulation Booster which provides this treatment in quite a unique way. Read our findings below to determine if this is what your body needs at the moment. What is EMS? But why EMS? EMS devices provide this by sending electrical currents into your body via the patches you stick to your body or via the areas of the machine that make contact with your skin. The electrical current causes muscles to contract which automatically affects blood circulation. But why use this almost artificial method? Because it requires little effort and this is very beneficial when you’re recovering. You may not have the ability to exercise much but with EMS that doesn’t mean you can’t keep your muscles working. EMS will cause you less pain than going for a workout or a run but will still benefit your muscles. It’s also ideal if you’re prone to pain in your joints in which case exercising can lead to much discomfort and/or pain.Impressive, right? Now the question is whether the Revitive Circulation Booster is a good tool if this is what you’re after. First off the Revitive Circulation Booster works on a very specific area of the body rather than the whole body as some EMS devices do. 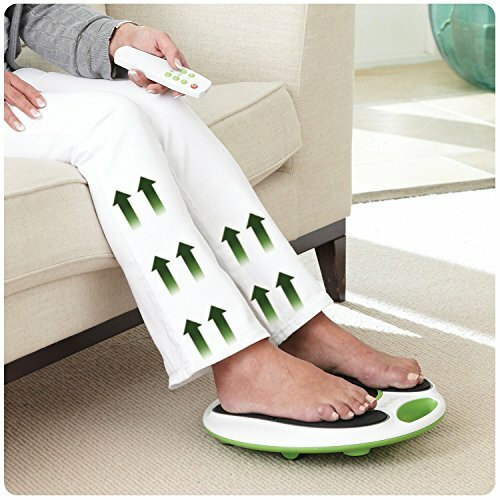 It’s a foot circulation machine you stand on and when turned on it will send electrical pulses into your body via the soles of your feet. It’s important to note that using it while sitting down (allowing it to move back and forth) forms part of its efficiency so it’s not ideal to use in any other scenario such as while lying in bed. Because you can use it while sitting down it’s ideal for injured individuals or seniors who can’t manage to stand up. They can still give their legs a workout to improve strength or simply maintain health. This is specifically a foot circulation booster but you also get a few electrode body pads to attach to other areas of the body to administer EMS there as well. While EMS devices can be purchased over the counter and you can use it without a doctor’s instructions, if you’re facing serious pain problems you need to know you’re doing it right.It’s encouraging to know the Revitive Circulation Booster is professionally viewed as a prescription strength stimulator. This makes it a practical option for serious conditions if you don’t have time to visit your doctor or physiotherapist. It helps for quite a few conditions. The stimulated nerve endings in your feet will activate muscles in your legs (your lower legs specifically) to contract and relax continuously. This movement will increase the blood flow to those areas which leads to pain relief when more oxygen helps cells recover. 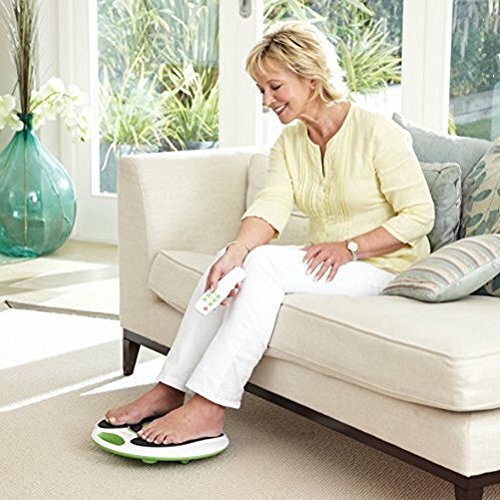 Because it has so many settings you can use it for anything from tired feet after a day of standing to stimulating injured muscles to strengthening them and help them heal. You can pick a setting to help you relax and unwind tired muscles or crank it up to a high charge to give muscles a serious workout.This treatment can help you combat the effects of diabetes such as neuropathy pain. Some consumers report they need to turn it to lower settings a few weeks after starting use. The regular stimulation can affect nerve endings and make you feel more than you used to. The results range from improving blood flow to pain relief to actually strengthening muscles. Yes, that’s how powerful this machine’s pulses are. Some consumers also use it to treat blocked veins or at least maintain blood flow when they are prone to get blockages. When you have blocked veins it’s imperative you keep moving so muscle movements can stimulate blood flow. However, if your job or an injury forces you to sit still for long periods of time this machine can simulate physical movement so your arteries don’t deteriorate. Perhaps you simply have some swelling in your joints? When you increase blood circulation it affects inflammation and can help reduce swollen areas too. Many of these effects lead to better sleep quality thanks to less pain at night, which automatically also helps your body recover faster. You get 99 different intensity settings so you can make adjustments until you get the right level for your needs. Do you desire comfort or are you brave enough to handle some discomfort on higher settings to give your body the optimal chance of recovery? Whether you’re after a light workout simply to stimulate blood flow or whether you need to target an area with stronger pulses to get results faster, there will be a setting for you. You also have a variety of stimulating patterns to pick from. Each one will affect you differently so it once again helps you customize your treatment to what your body needs. IsoRocker: Part of the efficacy is thanks to a new feature the brand used called the 20° IsoRocker. Battery powered: Cord powered models and AAA battery powered models are available. The latter is a practical unit to travel with since your treatments aren’t dependant on being near AC power outlets. Remote: It has buttons on the device itself as well as a remote to change your settings. 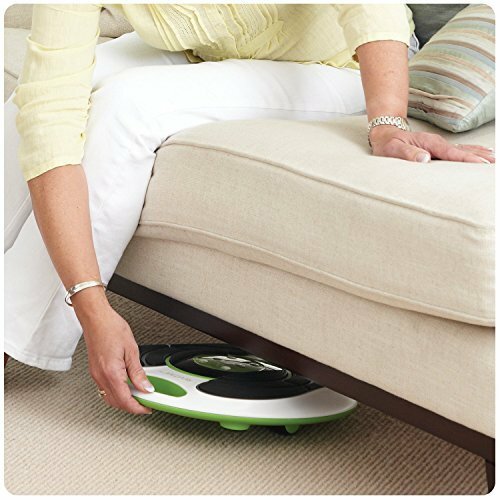 This is handy because you can comfortably sit back and manage the strength of the pulses without bending down. This also makes it user friendly for the elderly who may not be able to bend down. Timer: You can set it to a specific treatment time so you can sit back and enjoy instead of focusing on the clock. The specs make it practical to store in a cupboard or even underneath a bench with ease. It’s probably a bit too bulky to put in your luggage but depending on the situation you may be able to travel with this if you think you’ll need treatments while not at home. Another thing that’s beneficial about the Circulation Booster is how little time it requires. You need 20 to 30 minutes which makes it practical to use during a lunch break at work or at night before you go to bed. You can decide how many times a day you want to use it because it won’t have any negative effects if used a lot. Of course it’s important to pick high quality items where electrical impulses are used because you don’t want to hurt your body in the process. It’s impressive that the Revitive device was designed by medical specialists. It’s also comforting to know that the Revitive Circulation Booster is FDA approved and cleared as a Class II medical device. The other technology used in this design - Wide Pulse Technology - is currently still pending a patent but it has been clinically tested. 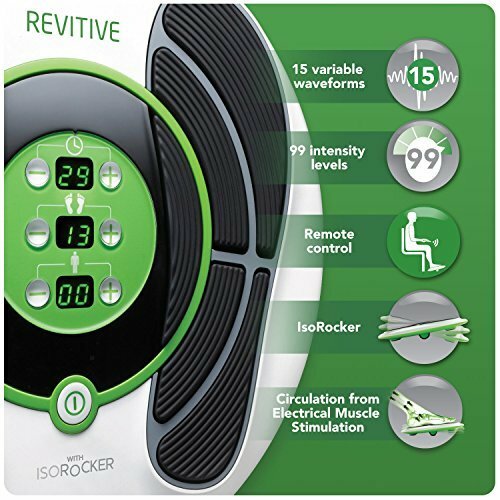 This feature of the foot circulation machine can increase blood flow up to 53% according to Revitive medic reviews. Who Can Not Use Revitive? Also Revitive medic reviews state that if you’re wearing a pacemaker, have an implanted defibrillator or you use any implanted electronic devices you can’t use this. It’s important to note that this won’t work for every injury you have. Some consumers using it on very old injuries or areas with metal implants don’t experience pain relief. So is this an investment in your health? As long as increased blood flow is what your body needs this could be your solution. It’s definitely a comfortable option since it’s designed to have you sit back and enjoy the treatment. However it has limited treatment options as you can’t really use this in any other situation such as while lying in bed. If you’re looking for treatment for your legs this is ideal but if you need a machine that can easily be used for other parts of the body too, you may need a different device.